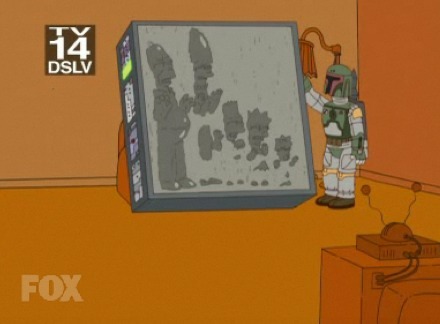 Message Boards - Boba Fett Fan Club → Fans → Favorite Simpsons character? Hey, Its me, GLOPINO wanting to know who your favorite Simpsons character of alltime is. My favorite character is Bart. All of them are great, but probsbly Homer. Never liked Simpsons. Don't know why. Yellow people repulse me. I like Bart and Homer.THey RuLE! Ya! Homer and Bart are the bests! Ralph Wiggim!! Nothing more needs to be said!! I am not a big fan of the show either(namely because it taunts my last name). However, I do like the character that looks and speaks like Arnold Shwarzennager(my spelling stinks I Know). Mr. Burns: Is pure awesome. He's evil. But he's the sort of evil I could see myself being if I were old and rich. So I guess he reminds me of my potential. Sideshow Bob: Is also evil. But not by choice. He's intelligent and has the whole poetic/actor/dramatic/whatever aspect. He just can't really help but be forced into being criminal sometimes. Maggie: Well, as my husband said, she's the gunslinger in the family. She also seems to be the smartest. You know, another good question would be, which one are you most like? I think I'm most like Marge, actually. But deep inside I WANT to be Mr. Burns. My favorite Simpsons character would be either Lisa, The Church pastor, or the two alien twins from Uranus. I guess I'm a little weird that way. When I was 10... so was Bart, and he was my favorite character. Now I'm 32, and Bart's still 10... and Homer is my favorite character. I have no idea what that says about anything, just felt I'd chime in. Aside from the whole "dumb as a brick" bit, I'm just like Homer. Ask Miba. My favorite character would have to be Mr.Burns. He's just so weird and funny its hard to describe him if you watch the Simpsons you should know what i mean. Oh by the way check out this picture. I would say either Apoo, The guy from the comic bookstore you know the one who says ("worst thing ever" ) or probably Flanders. He cracks me up. I can't choose just one! I like Moe,Apu,and Troy McClure.Also, Professor Frink.Even though he doesn't have that much screen time, every once in a while he has a comedic gem. For the first few years of the show Bart had my heart but over the years Homer's amazing stupidity won me over. I especially relate to his quote,"Alcohol, the cause of and solution to, all of life's problems."